The Youth and Philanthropy Initiative (YPI) is an active citizenship programme that raises awareness amongst young people about philanthropy and their local community. Each participating school, each year is responsible for directing a £3000 YPI Grant to a local charity through a unique programme of team work, research and competition. Our S3 pupils have been working on this over the last term. The charities were: Befrienders Highland, Poolewe Swimmming Pool, Dundonnell Mountain Rescue, Wester Ross Youth Football Club and Family First. Each charity sent a representative on the day to be part of the competition. The judges were impressed by the level of research and work that had been put into the presentations and found it very difficult to decide on a winner. The charity that won on the day was Dundonnell Mountain Rescue Team. 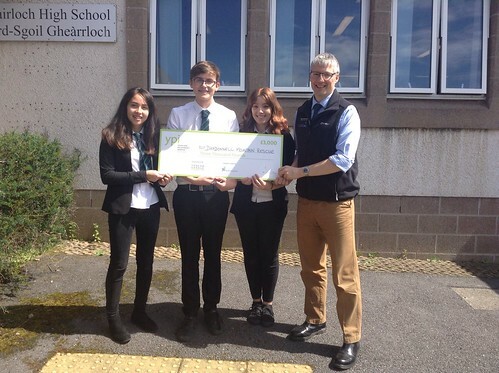 Congratulations to Amy Nieto, George Pickering and Isabelle Gallacher for their hard work and interesting presentation, the team representative Andrew Vickerstaff, was delighted to be receiving £3000. Thank you to the panel of judges Stuart Smith (parent council) Julia Alexander (local fundraiser) Evan Macphail and Lucas Jackson (senior pupils) and Linda Schubert representative of the Wood Foundation.